Guitar Heroes is a music team building program where you learn to perform classic rock songs together on guitar and bass guitar in two hours – even if you’ve never touched a guitar before! Here’s your chance to live the fantasy when our rock and roll facilitators lead your teams through this exciting and memorable musical experience. Each rocker on your team learns enough technique on a guitar or bass to perform several classic rock tunes. Guitars are tuned in an innovative tuning that makes it easy for your team to rock out. Bass guitar parts are designed to sound good, yet be easy to play. And we keep the energy high with fun activities, such as our air guitar competition and speed picking ‘note-off’. By listening and playing together, your team forms a solid foundation of communication and mutual appreciation that allows for true teamwork and a common rhythm back at work. And, of course, the band can include singers and others playing cool hand percussion instruments. There’s a role for everyone to play during Guitar Heroes. 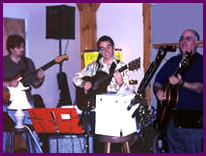 Teams play with professional musicians that make everyone sound good and help everyone have fun. Whether you’ve always wanted to turn a guitar amp up to eleven, play in Dm, “the saddest of all keys,” are an expert at air guitar or just want to feel the joy of playing an instrument you never thought you’d be able to, Guitar Heroes is for you! This program can include a debrief by a trained facilitator around new discoveries about your team, and celebration of successes. The debrief can be customized for your group goals. Approximately two hours. This program is also available as part of a one-day workshop including a range of fun and stimulating team-building exercises.